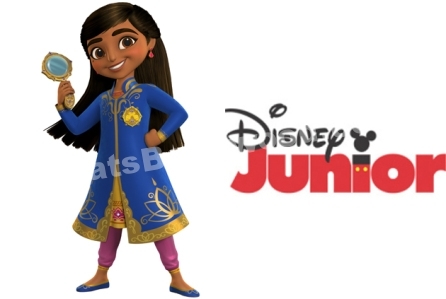 Disney Junior has launched production on Mira, Royal Detective, an animated series set for 2020 that will give young’uns a look at Indian culture and customs. With voice work by such familiar names as Freida Pinto, Kal Penn, Aasif Mandvi and Sarita Choudhury, the series follows Mira (newcomer Leela Ladnier), a brave and resourceful commoner who is appointed to the role of royal detective after solving a mystery that involves saving the kingdom’s young prince. She travels the magical Indian-inspired kingdom of Jalpur helping royals and commoners alike and will stop at nothing to solve a case, along with her friend Prince Neel (Kamran Lucas), a talented inventor; creative cousin Priya (Roshni Edwards); and comical mongoose sidekicks Mikku (Penn) and Chikku (Utkarsh Ambudkar). Mira’s adventures highlight critical thinking and encourage deductive reasoning while showcasing India’s vibrant heritage, Disney Junior said. Each preschooler-targetred episode will weave authentic music, dance and customs into two 11-minutes stories. The voice cast also includes Hannah Simone, Jameela Jamil, Utkarsh Ambudkar, Aparna Nancherla, Kamran Lucas, Karan Brar, Karan Soni, Sarayu Blue, Parvesh Cheena and Sonal Shah. Produced by Wild Canary in association with Disney Junior, Mira, Royal Detective is executive produced by Sascha Paladino. The series was developed by Becca Topol, who also serves as story editor.